The Nalgonda Ranga Reddy Milk Producers Mutually Aided Coop. 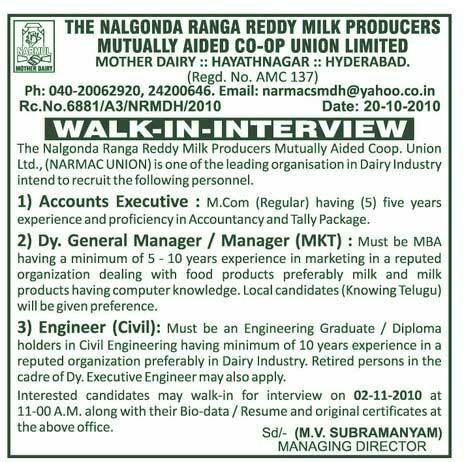 Union Ltd., (NARMAC UNION) is one of the leading organisation in Dairy Industry intend to recruit the following personnel. M.Com (Regular) having (5) five years experience and proficiency in Accountancy and Tally Package. Must be MBA having a minimum of 5 -10 years experience in marketing in a reputed organization dealing with food products preferably milk and milk products having computer knowledge. Local candidates (Knowing Telugu) will be given preference. Must be an Engineering Graduate / Diploma holders in Civil Engineering having minimum of 10 years experience in a reputed organization preferably in Dairy Industry. Retired persons in the cadre of Dy. Executive Engineer may also apply. Interested candidates may walk-in for interview on 02-11-2010 at 11-00 A.M. along with their Bio-data / Resume and original certificates at the above office.